The Colorado River may not look like it, but it’s one of the world’s largest banks. The river is not only the source of much of the American West’s economic productivity – San Diego, Phoenix and Denver would hardly exist without it – but its water is now the central commodity in a complex accounting system used by major farmers and entire states. Now, when talking about the river, water officials across the West use terms like bank, payback and surplus. Often the analogies to finance don’t stop there – they put money behind deals that dictate who gets water and who does not. This month, the nation’s largest water agency, the Metropolitan Water District, began what amounts to a run on the bank. The district – which delivers water across Southern California, including to San Diego – started rapidly withdrawing water from the river, which is stored behind Hoover Dam in Lake Mead. 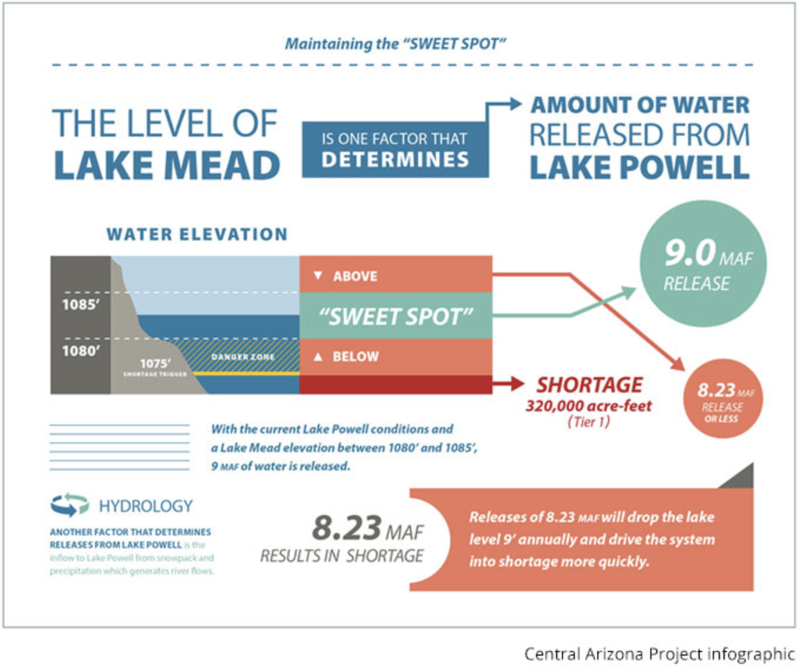 At last count, Lake Mead stood just six feet away from falling into shortage, the first step toward rationing water. There was already about a 50-50 chance the river would fall that far this year. The chances are even higher now, because Metropolitan’s plan to withdraw as much water as it can may cause the lake to drop four or five feet – though the lake will rise again as snow melts this spring. Once there’s a shortage, Arizona is supposed to be in trouble. At least on paper, California’s rights to the river’s water are so secure that Arizona’s water supply would have to run dry before California loses a single drop. That’s politically impossible since 7 million people live in Arizona and need water. So for several years, Metropolitan and a clutch of power-players across seven states have been trying to reach a different, more realistic deal. Their efforts have repeatedly stalled, mostly because of squabbling within Arizona, which is ironic because the state stands to lose so much unless something changes. The deal would allow Metropolitan to withdraw banked water even during an official shortage. But now Metropolitan is preparing for the worst-case scenario, which is a combination of uncertainty and a banking freeze. Still, district officials hopes Arizona signs a deal in coming weeks. “We’re not at the point of no return,” said ​Bill Hasencamp, the district’s manager of Colorado River resources. Last year, the agency that runs Arizona’s water system, the Central Arizona Project, got busted using water accounting quirks to get more water from the upper basin than it needed. Officials in the upper basin accused Arizona of threatening the water supply for 40 million people. For decades, water officials across the region have alternated between working together to share the river and fighting like hell to horde it. Following a long-running Supreme Court battle between California and Arizona, the Bureau of Reclamation in the mid-1960s created a modern accounting system to track who was using how much of the river from year to year. For the past two decades, the river has been in drought. Partly to cope with that, states and water agencies began to use that tracking system to create increasingly complex transactions. The original laws governing the river don’t anticipate users would save water one year and claim the right to use that water in future years, the practice known as banking. The old laws also don’t anticipate or even allow the sale of water across state lines. That has fallen by the wayside as a series of sophisticated transactions have proliferated, where states bank and transfer water. The Southern Nevada Water Authority, for instance, has sent enough water for several million of its residents to Arizona, where it is stored underground. When Nevada wants its water back, it won’t actually pump that water up from the ground. Arizona will curb its use of the Colorado River and let Nevada take water otherwise earmarked for Arizona. Likewise, if the new river-sharing deal happens, Nevada has promised to lend water to Metropolitan that, in turn, will help Arizona avoid devastating cuts. “It’s creative ways to live within the existing law of the river,” Hasencamp said. Indian tribes saw it another way. They complained early on that transactions would rely on water that actually belongs to tribes. On paper the tribe have rights to lots of water, even though they currently lack a real way to get most of that water from the river to their land. So other states are essentially banking on tribes not getting that water anytime soon. “It is logical to expect that the current water users will have even more incentive to resist the development of Colorado River water by the Navajo Nation in order to minimize their risk of shortage,” the tribe wrote in a 2007 letter to federal officials. There are two ways to get people to use less water. The first is to forbid them from using it, the regulatory approach. The second is to pay them not to, the market approach. Because regulations often end up in court, some water officials think throwing money at the problem is easier. Most Colorado River water is still used for farming. So when push comes to shove in a drought, cities will end up paying farmers to use less water. Over the past several years, cities from Los Angeles to Phoenix to Denver pooled their money to pay farmers to use less water. These payouts happened up and down both basins: In 2017, cities paid $635,000 to a New Mexican farmer who stopped growing corn, potatoes, alfalfa and beans along the San Juan River, one of the Colorado’s far-flung tributaries. They paid several farmers along the Price River in Utah about $370,000 to idle their fields or change how they water them. Several farmers along Fontenelle Creek in Wyoming changed how they watered their pastures and got a few hundred thousand dollars in return. The biggest transaction of all is between the San Diego County Water Authority and the Imperial Irrigation District. 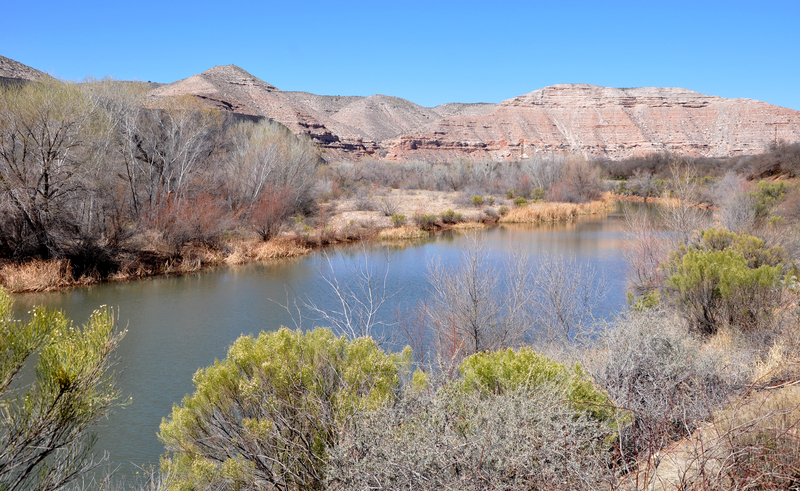 The irrigation district, which provides water to farmers in Imperial County, holds rights to as much Colorado River water as the states of Arizona and Nevada combined. In exchange for billions of dollars, the Water Authority can use some of Imperial’s high-priority water rights for decades to come. For now, that deal insulates San Diego from some of the drama on the Colorado, but Water Authority officials have actually wanted to get in the mix. For several months, the Water Authority has said it would like to leave some of the water it buys from Imperial in the river. In doing so, San Diego water officials would forgo using water they spent a quarter century trying to get and fighting over in court. When the California drought left those northern rivers empty, Metropolitan began drawing as much water as it could from the Colorado. But when the drought ended here but continued on the Colorado River, Metropolitan began using as much Northern California water as it could and leaving water in Lake Mead. That’s some of the banked water it could now lose. Recently, Metropolitan projected how much it would cost to replace some of its Colorado River supplies in coming years. Depending on the scenario, that could cost between $80 million and $954 million, though those numbers are pretty rough and would be divided up among 19 million people who get water from the district.